This entry was first published on September 5, 2018. No earlier editions exist. Archaeology is important because it expands our understanding of history beyond what is documented in written records. It allows us to get a glimpse into the lives of past peoples and cultures, and even allows us to trace human origins and migration. Archaeological sites are geographic locations with any detectable evidence of past human activities open sites (those exposed to the elements); caves and rock shelters; shipwrecks; tombs. They include both prehistoric and historic locations and served a variety of functions including but not limited to: habitation, tool production, agriculture, hunting or trapping, cooking or butchering, quarrying, storage, burial, and transportation (Sutton & Arkush, 2006). Geographic Information Science and Technology (GIS&T) for archaeology is the use of remote sensing, spatial analysis, and mapping tools to advance the identification, documentation, and study of archaeological resources. It is founded largely on the principles of landscape archaeology. Landscape archaeology is the study of the physical, cultural, and biological environment associated with archaeological sites and how people interacted with and were influenced by their landscapes (Hu, 2012; Soennecken, Olsvig-Whittaker, Leiverkus, & Shmida, 2017). GIS&T has become invaluable to archaeology because it offers a platform that can cross-reference and analyze a wide variety of data types ranging from satellite imagery, field surveys, and even historical maps, providing a more complete understanding of archaeological landscapes and spatial relationships of features. This chapter begins with an introduction to some of the primary GIS&T tools used in archaeology and how they work. Next, it covers the main application areas to which these tools are applied. Many of the tools discussed can be used for more than one application depending on the research question being asked. The value of aerial photography was realized as early as 1899 when Giacomo Boni photographed Rome from a hot air balloon (G. J. J. Verhoeven, 2009). Today, aerial photography is most often acquired from airplanes; however, unmanned aerial vehicles (UAVs), also known as drones, are becoming more common. Archaeologists primarily use aerial photography to generate more accurate maps over wide areas, to illustrate landscape patterns, and to better document sites. Historical aerial photographs have even been used to study land cover change. The use of satellite imagery for archaeology gained ground with the 1995 declassification of imagery from the Corona spy satellite mission (Ruffner, McDonald, Koch, & Warner, 1995). Corona was the first in a series of earth observing satellites to release imagery for public use; followed by SPOT (a French satellite), Ikonos and Quickbird (both privately owned, commercial satellites), and the USGS/NASA Landsat series. The arrival of high spatial resolution photography and spectral imagery collected by satellites has led to a new subfield in archaeology known as spectral imagery analysis, or the study of the earth through reflected or emitted electromagnetic energy (Campbell & Wynne, 2011). Multispectral imagery is primarily used to study variations in land surface and vegetation patterns through analysis of the visible portion of the Electromagnetic Spectrum (EM) (0.38-0.72 µm) as well as the near infrared (NIR) (0.72-1.30 µm) (Campbell & Wynne, 2011) (Figure 2). The NIR wavelengths are highly reflected by the chlorophyll and moisture in leaves, meaning that healthy, green vegetation appears bright in the imagery while stressed vegetation appears much darker. These stress markers can indicate the presence of underlying structures such as the remains of walls, burials, and even crop rows; as such features can impede or encourage vegetation growth. Thermal imagery records the reflectance or emittance of the thermal infrared portion of the spectrum (approximately 3-300µm). Some archaeological structures, such as those built from stone, absorb more heat than the surrounding soil and release it more slowly, appearing brighter in thermal imagery (Ben-Dor, Portugali, Kochavi, Shimoni, & Vinitzky, 1999). Hyperspectral imagery is one of the newest products being tested for archaeological application. It is similar to multispectral imagery but records multiple layers within each of the visible, near infrared, shortwave infrared and thermal infrared bands (Campbell & Wynne, 2011). By analyzing many more parts of the electromagnetic spectrum, it is capable of detecting minute variations and patterns that other methods might miss (Cavalli, Colosi, Palombo, Pignatti, & Poscolieri, 2007; Rowlands & Sarris, 2007). Figure 2. Where visible light, infrared, and thermal (radiant heat) portions are located in the electromagnetic spectrum. The challenge in applying automated detection methods to the analysis of spectral imagery for archaeology lies in the similarity between archaeological structures and their surrounding environment. At present, the best results are produced through visual analysis of the results of image analyses techniques such as principal component analysis, varying band selections, contrast enhancement, spatial filtering, and edge enhancement on a site to site basis (G. J. Verhoeven, Smet, Poelman, & Vermeulen, 2009; Winterbottom & Dawson, 2005). All of these techniques are used to highlight patterns and features on the landscape, such as linear, circular, or geometric shapes, which do not occur naturally. 2.2 Geophysical Surveys; including electrical resistivity, electromagnetic conductivity, ground-penetrating radar (GPR), magnetic variation, and seismic refraction; are near-surface techniques that archaeologists use to map buried features. Each sensor measures the time elapsed between an emitted pulse and its return to the sensor. Variations in the time it takes the pulse to return to the sensor is used to map everything from natural geomorphic features to archaeological features such as buried architecture, human activity zones, and even burials (Fernández-Álvarez, Rubio-Melendi, Martínez-Velasco, Pringle, & Aguilera, 2016; Roosevelt, 2007). 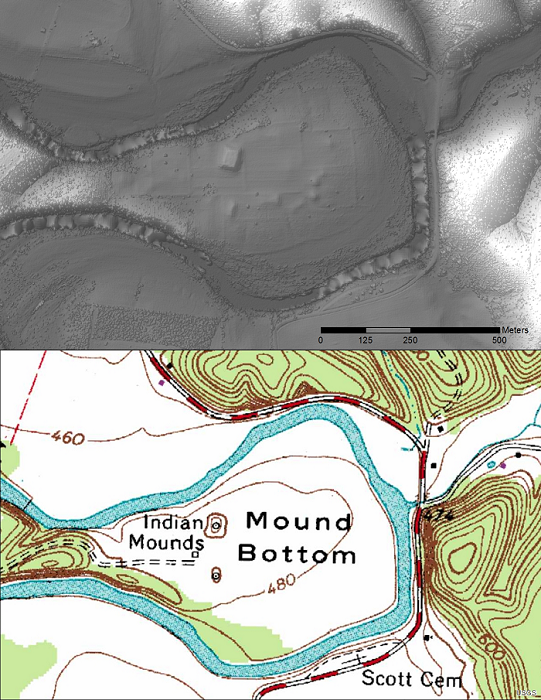 Archaeologists use Digital Elevation Models (DEMs) to discern patterns on the ground surface that indicate human modifications to the landscape. Historically, aerial photography has been used to create elevation maps, but with the introduction of LiDAR and radar, elevation models have become more accurate and detailed. LiDAR and radar are especially useful because of their ability to penetrate some types of groundcover such as sands or vegetation and record the elevation of the land surface beneath. These data are then used to create a kind of DEM known as bare-earth models. Photogrammetry is the use of overlapping aerial photographs of the same location but with slightly different perspectives. These photographs are known as stereo-pairs and are used to extract elevations based on the geometry of intersecting features. This is especially useful in the study of changing landscapes over time when historical aerial photography is available (Pérez Álvarez, Herrera, Martínez del Pozo, & de Tena, 2013). Radio Detection and Ranging (Radar) is used to gather elevation data by measuring the time that passes between when a radio signal is transmitted from a sensor and when it returns. Researchers have found that NASA’s Shuttle Radar Topology Mission (SRTM) is capable of penetrating up to 15 cm of surface sands and reflecting off of underlying features, making it particularly useful for modelling and reconstructing past landscapes such as river systems in arid terrain. While it is very useful for the study of wider landscapes, the low spatial resolution of SRTM imagery (30m) makes it impractical for studying small features (Campbell & Wynne, 2011). Light Detection and Ranging (LiDAR) is used to create 3D models by calculating the time it takes for a pulse of light to reach a target and return to the sensor. The advantage of LiDAR over radar is that it usually has better spatial resolution and it can be calibrated to penetrate vegetation and produce bare-earth Digital Terrain Models (DTM) in heavily forested environments (Challis, 2006; Doneus, Briese, Fera, & Janner, 2008) (See cover image). It should be noted that LiDAR can be either airborne or terrestrial; airborne LiDAR is used to map landscapes while terrestrial systems are used to create 3D reconstructions of objects such as buildings. Sound Navigation and Ranging (SONAR) (100-500 kHz) is used in marine surveying to create DEMs of the ocean floor known as bathymetric maps. The key to underwater surveying is navigation. Traditional GPS does not work underwater because it relies on the electromagnetic spectrum, which is distorted underwater; instead, archaeologists use sound to measure their location. SONAR pings are emitted from a submerged vehicle or tethered platform and the time it takes the signal to return to the sensor is then converted to real-world coordinates. The coordinates are then processed to create a 3D map of the site with spatial accuracy of up to a few centimeters. It is critical to be able to repeatedly and precisely locate the vehicle above the site in order to make accurate measurements. SONAR surveys are most often used to detect shipwrecks but have also helped identify submerged prehistoric sites (Ballard, 2007; Mindell, 2007). When deciding which tools or sensor types to use in an analysis, it is important to consider the nature of the site and the questions being asked. For example, each of the geophysical tools responds differently to variations in soil composition and moisture content. If the wrong method is chosen, the quality of the results will decrease. Another example, as mentioned above, is Radar versus LiDAR: SRTM, with 30-meter resolution, is best used for large scale landscapes such as entire watersheds while Lidar, which can be calibrated to a very fine scale, is better when working on smaller sites like village complexes. Geographic Information Systems (GIS) are spatial mapping tools that expand the understanding of archaeological resources by providing a spatial perspective and helps bridge that gap between qualitative and quantitative studies. GIS are commonly used by archaeologists to prepare field maps in preparation for fieldwork, mapping GPS data collected in the field and recording detailed excavation data. For example, historic records, maps and photographs can be used in a GIS to analyze the growth or disappearance of cities or towns over centuries (Tucci, Ronza, & Giordano, 2011) or predict where historic features might be located on a modern landscape. GIS use geospatial databases to store large amounts of information in one place. While not all are publicly available, geospatial databases allow users and researchers to view and sometimes download spatial data. They can be used to understand and analyze how archaeological sites, features, and artifacts are related to each other in space by analyzing patterns across not only a single site but between sites, across regions, and even across continents. For example, a spatial database of historic and prehistoric sites can be compared to geomorphic maps to better understand the settlement distribution patterns of different groups of people (Bauer, Nicoll, Park, & Matney, 2004). See the additional resources below to explore some examples of archaeological geodatabases. GIS&T for archaeology can be categorized into three primary applications: Prospection, Documentation, and Geospatial Analysis. Prospection is the study of the surface and near-surface environment to collect information about what lies beneath the surface before excavation. For GIS&T, this includes airborne and spaceborne remote sensing, geophysical surveys, and marine surveys (Wiseman & El-Baz, 2007). Documentation is the creation of detailed geodatabases, maps, and models of structures and landscapes to provide as complete a picture of a site as possible. Documentation is important for resource preservation, furthering future research, improving public knowledge and education, and generating realistic re-creations of the world of the past (Barazzetti, Binda, Scaioni, & Taranto, 2011). This application area takes particular advantage of GIS, aerial photography, and LiDAR. Spatial Analysis is the study of the distribution of and spatial relationships between archaeological resources through the use of landscape analysis, networks analysis, artifact distribution, and migration patterns (Haak et al., 2010). Landscape analysis is the study of how people in the past utilized and modified the landscapes around them. This is done by identifying patterns that indicate past human habitation or activities and recreating ancient landscapes through both automated and visual analysis. One example of an automated modelling technique is identifying likely travel routes between prehistoric habitation sites, known as Least Cost Paths (LCP) analysis. This identifies topographic barriers that may impede travel and calculates the most likely path taken or path of least resistance (Howey, 2011). In using GIS&T, archaeologists draw principles from many other fields including geology, oceanography, botany, and meteorology to study environments altered by past humans. Large scale mapping tools can help increase the efficiency of ground surveys and offer a more complete understanding of sites and landscapes beyond traditional mapping methods. GIS&T for archaeology is a growing and changing field with new tools continually being developed and tested. Ballard, R. D. (2007). Archaeological Oceanography. In Remote Sensing in Archaeology (pp. 479–497). New York, NY: Springer. Ben-Dor, E., Portugali, M., Kochavi, M., Shimoni, M., & Vinitzky, L. (1999). Airborne Thermal Video Radiometry and Excavation Planning at Tel Leviah, Golan Heights,Israel. Journal of Field Archaeology, 26(2), 117–127. Campbell, J. B., & Wynne, R. H. (2011). Introduction to Remote Sensing (5th ed.). New York, London: The Guilford Press. Mindell, D. A. (2007). Precision Navigation and Remote Sensing for Underwater Archaeology. In Remote Sensing in Archaeology (pp. 499–511). New York, NY: Springer. Roosevelt, A. C. (2007). Geophysical Archaeology in the Lower Amazon: A Research Strategy. In Remote Sensing in Archaeology (pp. 443–475). New York, NY: Springer. Ruffner, K. C., McDonald, J. K., Koch, S. A., & Warner, M. S. (1995). Corona: America’s first satellite program. Washington, D.C.: Morgan James Publishing. Sutton, M. Q., & Arkush, B. S. (2006). Archaeological Laboratory Methods An Introduction (4th ed.). Dubuque, IA: Kendall/Hunt Publishing Company. Wiseman, J., & El-Baz, F. (2007). Remote Sensing in Archaeology. New York, NY: Springer. Explain how environmental factors influence remote sensing tools. Describe the advantages and limitations of the different GIS&T tools. What are the primary applications of GIS&T in archaeology? Which remote sensing techniques can be used for both prospection and documentation? What is the primary characteristic of vegetation that is important in remote sensing for archaeology? What environmental factor determines the choice of geophysical survey to be used? Why is it important to understand the nature of the environment before selecting a tool? What perspective does GIS&T bring to archaeology and why is this important?